The physical embodiment of the tropical island dream, French Polynesia is rich in culture, stunning blue lagoons and home to the rare Tahitian black pearl. 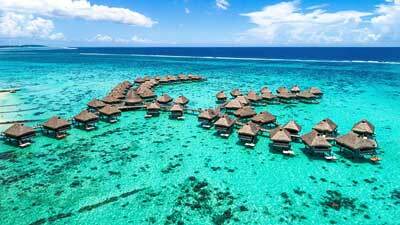 Escape to the islands of Tahiti with remarkable snorkelling, private islands and romantic overwater bungalows. Famous for black sand beaches, outrigger va’a canoes, and traditional dance, there are many things to see and do in Tahiti. Experience the true Polynesian way of life lounging on remote, pristine beaches, dive sunken ships and planes, and see why this is one of the most islands on the planet. Take in the views of the ancient volcanic peaks of Mt. Otemanu. rising up from the picture-perfect, turquoise-blue lagoon of Bora Bora. Discover Polynesian history in Raiatea and try traditional island cuisine like raw fish marinated in coconut, live octopus, and food cooked in underground ovens or Hima’a. Explore the hidden mangroves, sea caves, waterfalls and traditional villages of Tahiti It, the most untouched part of the island and mostly only accessible by boat.